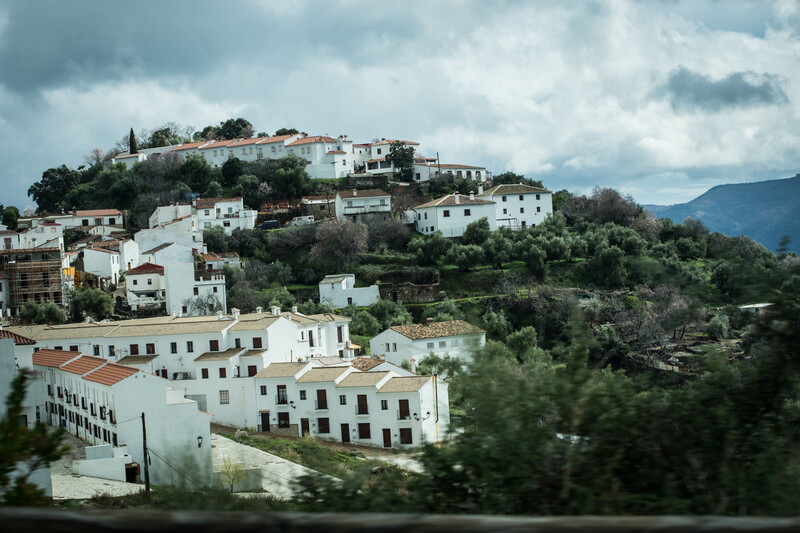 Passing Gaucín, one of Andalusia’s famous hillside ‘Pueblos Blancos’, our road trip route in the new 2017 BMW 530d xDrive switches from the A-405 onto the A-369. Up here, we’re now well and truly among the mountains. The dense vegetation (that provided our previous environs with an almost South American feel) is replaced here with jagged rocks, rising out of the earth. This almost lunar landscape lets us see how far skyward we’ve travelled, the forested roads that we’ve just travelled appearing as a small ribbon of black, disappearing every so often below that clouds. At this altitude – over 2,000ft above sea level – the temperature has dropped by over six degrees but the skies are a rich blue, providing plenty of incredible photo opportunities across the many valleys. Unlike the ‘405’, the A-369 constantly changes its elevation (as well as its direction), the tarmac seemingly laid right on top of the region’s incredible topography. It’s an additional challenge for the 1,560kg executive saloon but, again it doesn’t bat an eyelid, the slightly stiffer springing from the optional M Sport pack providing our chariot with even more poise through the twisting terrain. BMW wasn’t exaggerating when it called the new 5 Series its “most technologically advanced car ever”. 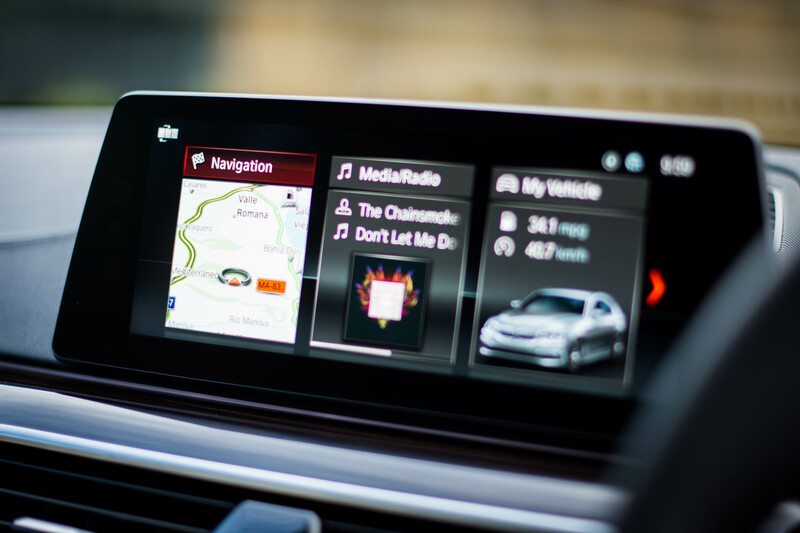 Raid the options list and the new 10.25-inch dash-top screen (controlled via touch, gesture and voice commands) is transformed into a seriously connected infotainment hub. Apple CarPlay is available wirelessly and Office365 integration enables you to dictate emails on the fly or automatically inform your colleagues of a new ETA should traffic (live updates of which now come as standard thanks to a complimentary SIM card) hold you up and scupper a calendar appointment. The real trump card though is the BMW Connected app (available on both iOS and Android). Learning your driving patterns, the app tells you when you need to leave or helps find your car in a busy car park by providing a 3D render of the surrounding area. Autonomous tech also features heavily, with lane-keep assist and radar-guided cruise control allowing up to 30 seconds of hands-free driving (intended to keep you out of trouble should your concentration waiver rather than a full self-driving mode). There’s also a 7 Series-esque key with a touchscreen that allows you to remotely park your car, or edge it out of tight spaces to make access easier. 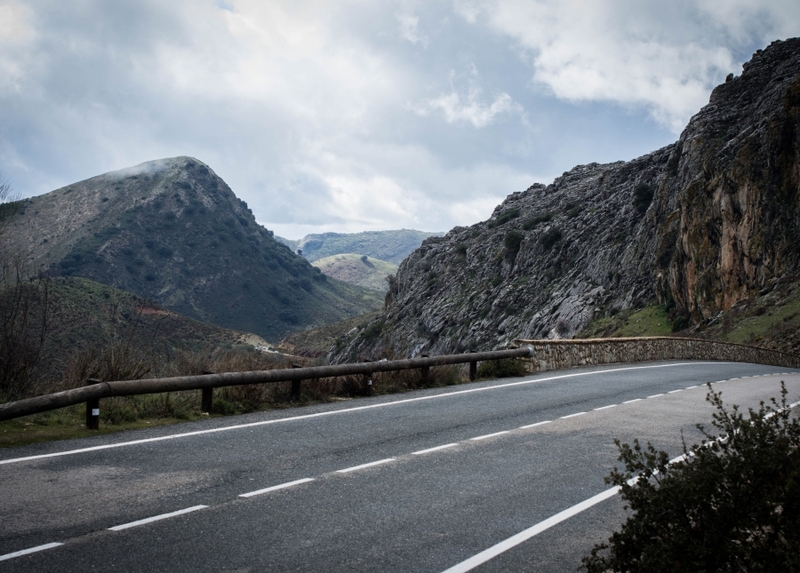 By the time we’ve traversed our way along the ridge of the mountain range to the famous medieval city of Ronda (stopping for a few too many photos along the way), the navigation system – complete with live traffic updates – is showing that we’re going to be a little bit late back to Finca Cortesin and our transfer back to Gibraltar Airport. 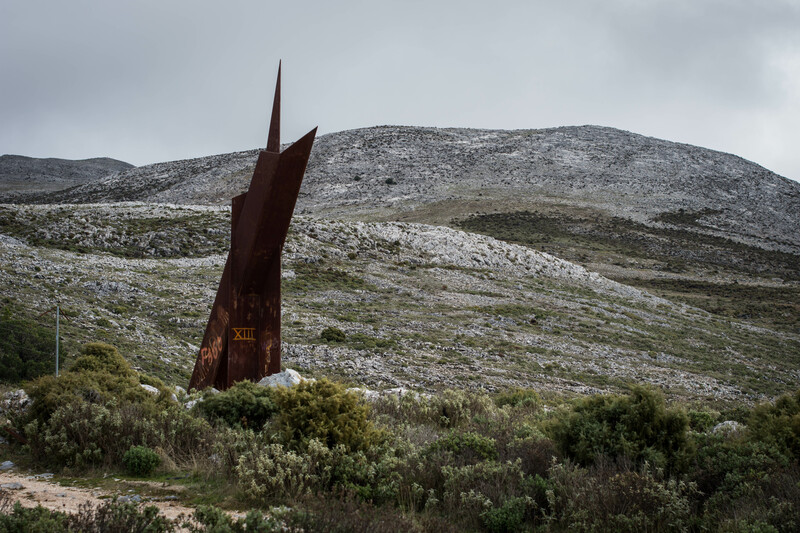 As we join the A-397 – the road that will take us back down towards the coast – we need to make up some time. Fast. 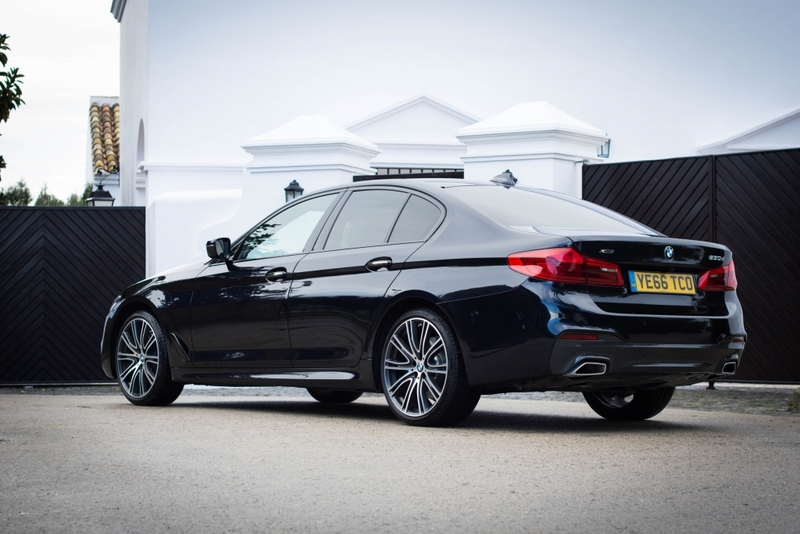 Setting the 530d xDrive into the ‘Adaptive’ drive mode, the car now adjusts itself to match our driving style, reading our inputs on the steering, throttle and brakes to provide the perfect throttle, steering and suspension settings. This, of course, is nothing new in the automotive world. 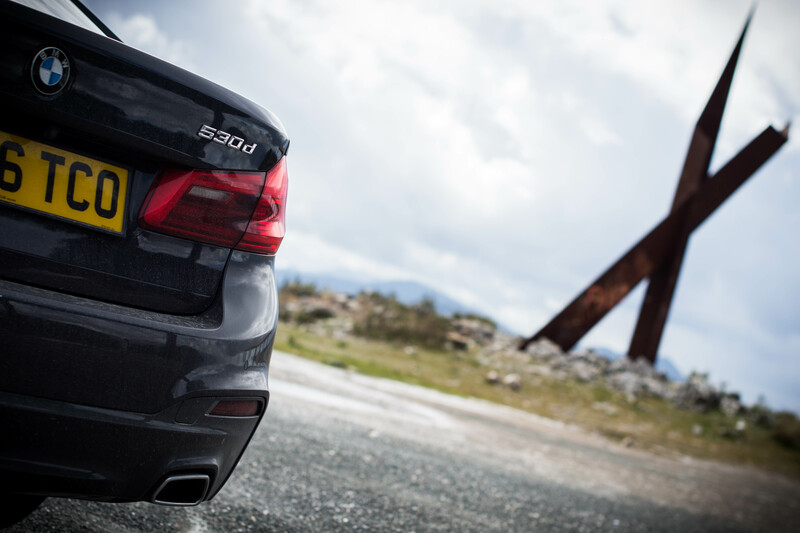 However, BMW has taken it a step further, integrating the system with sat-nav’s GPS data. 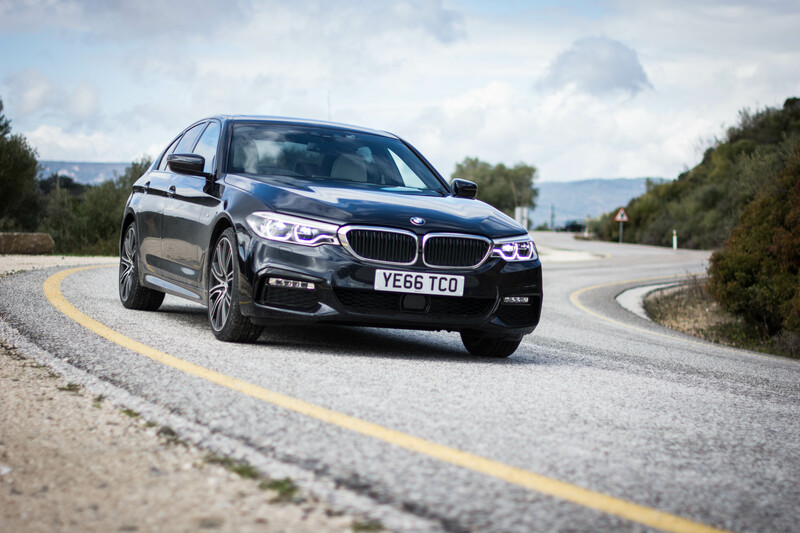 Rather than react to the environment around it, the new 5 Series can actual pre-empt the road ahead, effectively bracing itself if the tarmac is about to switch from arrow straight to tumultuously twisting. It’s the new saloon’s most impressive trick and, all the way back to the coastline, we don’t switch from this adaptive setting. If anything, it provides an even better drive than the usually preferable ‘Sport’ mode. While the ‘369’ requires you to take a car by the scruff of the neck, the A-397 is much wider, providing an almost race-track-like feel that requires you to maximise your momentum. The road is no less twisting but here the hairpins have smoother, longer radii, heavily loading up the front end of the 530d. It’s not hard to feel the effects of gravity either as we plummet back towards sea level. Braking into one of the hairpins, you can really feel the huge stoppers having to work against the gradient, trying to slow up 1.6 tonnes of executive saloon. While the pedal feel is great, it’s clear that the new 5 Series’ brakes aren’t always man enough for the task (though we are, admittedly, pushing on a little bit more than most prospective buyers). 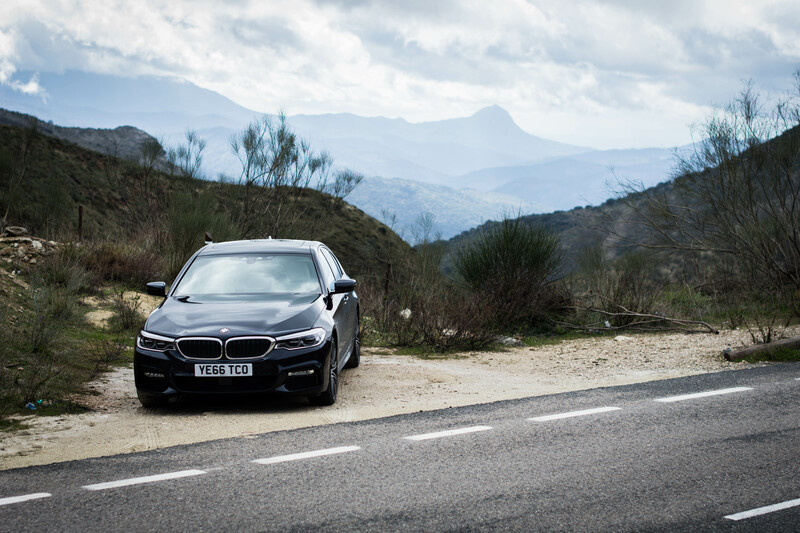 Hewn into the valley (with spectacular views over the gorge and the Costa del Sol), the ‘397’ feels undeniably like a Californian canyon pass and, despite the brakes, the dynamic talents of the 530d xDrive are clear to see. 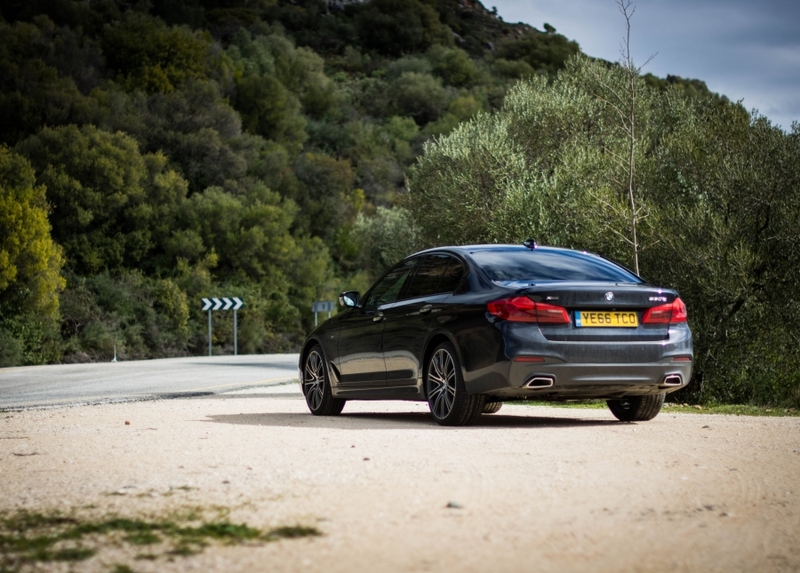 Yes, we’re sometimes over-stepping the mark but that’s because, very often, the G30-generation saloon actually feels more like an accomplished sports tourer. Compared to the last iteration, BMW has managed to save around 100kg (without the need for the carbon fibre structures seen in the latest 7 Series), while the xDrive four-wheel drive system makes prodigious use of the power on offer from the 3.0-litre diesel engine. 0-62mph is dispatched in a ludicrous 5.4 seconds thanks to an output of 265hp and a whopping 620Nm of torque. What’s more, the sound actually adds to the experience. Burbling gruffly at the bottom end, the noise reaches a pleasant growl towards the impressively high redline. Using the optional head-up display, we barely have to take our eyes off the road until we reach the A-7 coast road again. 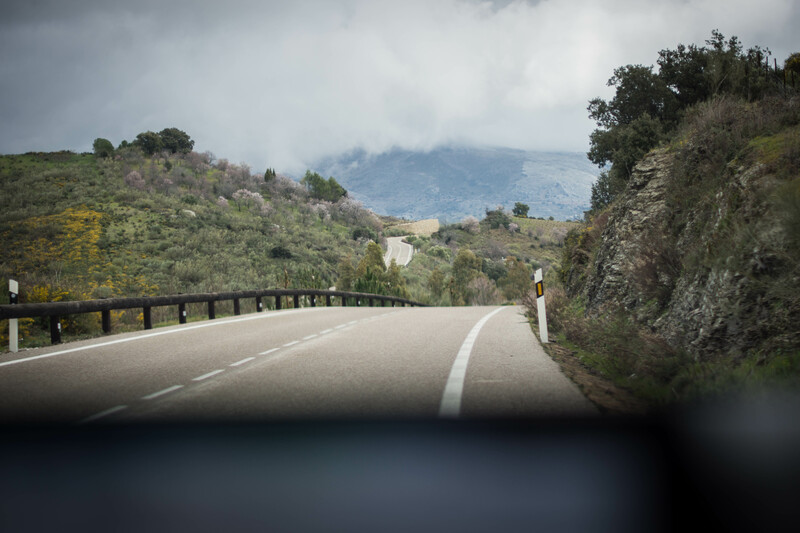 Everything we need to know (speed, speed limits and directions) is projected clearly onto the windscreen, with a bigger visual footprint than the previous F10 5 Series. A few glances at the bigger infotainment screen though does allow us to see that we’re make up time on our ETA though. We’re going to make it. Just. 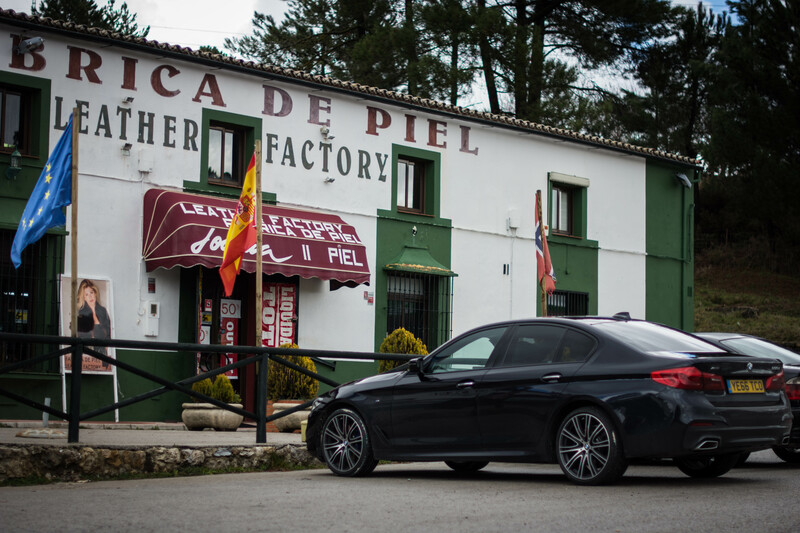 Arriving at the hotel with minutes to spare, the 5 Series ticks like a sports car as it cools down. Despite our enthusiasm, we’ve still averaged 30.1mpg over the nearly 200km trip and there’s half a tank of diesel left unused. If we didn’t have a plane to catch, we’d could happily go and do it all again.